a. Why do you need the information? b. What information do you need? c. In what other ways can the editor help you? I wish to draw your attention to an article - published on October 25, 2018 - in your esteemed newspaper, and request you to provide all the information at your disposal, so that I may be able to find a particular person whom I am searching for. The family members are unable to provide any information which may help me in any constructive way. So, if you could set up a meeting between me and the reporter of that article concerned - in your presence, of course - then it would be of immense help to me. A face-to-face meeting with the journalist can provide me with more information about where he gathered all his information from. And it is quite possible that I might finally get to talk with the person or persons who saw or interacted with him last. All this of course would be of immense help to me. However, you may assist us in several other ways too. You could help me set up a one-on-one meeting with the Minister of State for Law and Order. I am sure that after your intervention, he will take a concerned view of the incident and urge the police to do a thorough job of finding the child. Considerable awareness will be spread among Delhites about the matter if you front-page the article, and also tweet it using your personal handle. And this may help to bring about a closure to this matter. On behalf of the grieving family, I look forward to a favourable response from you. 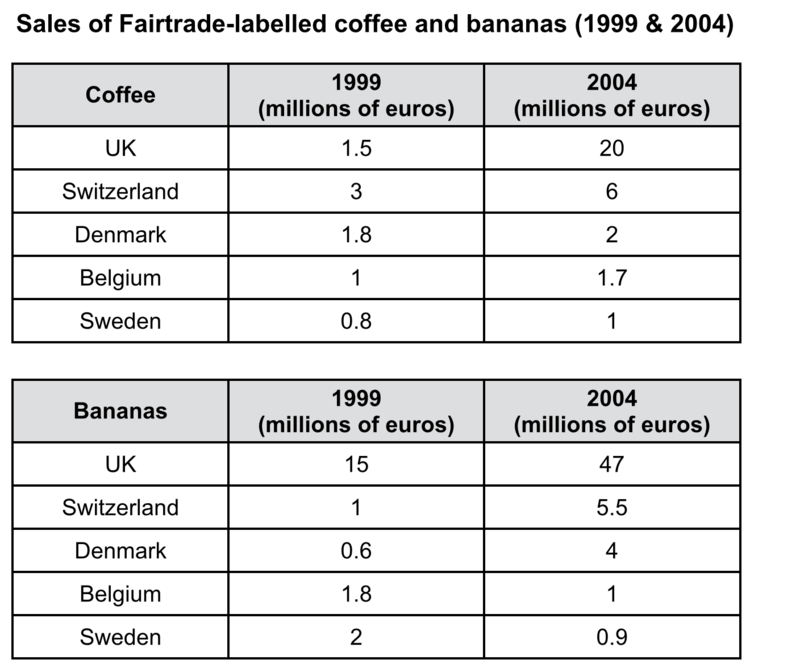 The given diagram comprises a couple of tables providing us information regarding sales of coffee and bananas, which are Fairtrade-labelled. The data pertains to two years namely, 1999 and 2004, shown in the middle and extreme right columns respectively. The study/survey was conducted in 5 developed European nations: Switzerland, the UK, Belgium, Sweden, and Denmark. 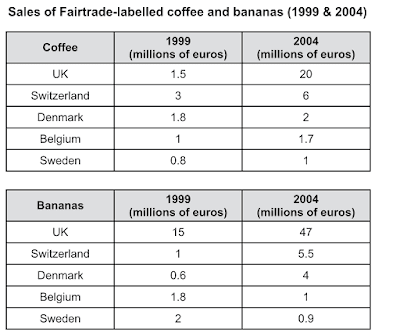 It is quite clear from the first table that coffee sales in Switzerland doubled 2004 when compared with 1999. Sales in Denmark, Belgium, and Sweden also increased over the period, though only marginally. The UK was simply unbelievable, leapfrogging from a mere 1.5 to a staggering 20 million euros over the period. In the sale of bananas, however, Switzerland and the UK have swapped places with the former showing a more than 300% jump to as much as 47 million euros in 2004. Sure, the percentage increase is more in the case of the UK, but its total sales figure in 2004 at 5.5 million euros is lesser than Switzerland's by over 9 times. Thus, it becomes quite evident that in both the coffee as well as banana markets, Switzerland and the UK have shown significant increase in their toplines over the given period. Denmark, Belgium and Sweden are, it seems, content to slug it out for the third spot. I have to give it to her. She worked so hard for this. She has earned it. Yes, she had the talent but, then, so many others do too. Her case proves me right yet again - talent must go hand in hand with hard work. Only then can you achieve Excellence. But excellence doesn't come in a day. It is shaped by a ruthless, single-minded adherence to a cause. Excellence, as Aristotle had observed many centuries ago, is a Habit. Live excellence. And it will be yours. When preparing for exams - domestic or overseas - give your all. The outcome may not be under your control; but how much effort you put in surely is. This effort consists of two elements - HARD WORK & ANALYSIS. Together they make a package that goes by the fancy name of STRATEGY. There is no substitute for hard work. At least 2 hours daily, over a month or more, depending on the kind of exam you are attempting. SAT, PTE, IELTS, TOEFL, TOEIC - for these 1 month is enough. However, for GMAT, GRE or CAT , you will surely need a 4-6-month preparation period. But don't just practice endlessly. Analyse your mistakes and learn from them. Also, don't concentrate on individual tests. Try to see your performance by averaging it over at least 10 tests. Your average score paints a truer picture. I encourage my students to do just that. Of course, my students can practice from the mocks and that they must. However, even as they do so every day, they must analyse their performance: what is their success rate? what kind of mistakes are they repeatedly making? Exactly where are they tripping up? It is this kind of analysis that helps you to improve with every test. Everyone fails. Failure is only the flip side of success. But those who eventually make the cut, actually find out WHY they have erred at certain places. Man has been able to conquer the world because of his sheer intellectual prowess. It is a god-given gift that distinguishes us from the monkey and the ape. Make good use of it. A new addition to the menu has been weekend grammar classes for Middle school students (classes 5-8). 1.5 hours per day on both Saturdays as well as Sundays. The class already boasts of a good 8-9 students who - much to our pleasure - are having a whale of a time. Grammar and fun usually do not go together. But this is exactly what Samit's English Academy wishes and endeavours to achieve: a win-win for both, the young stakeholders as well as their parents. The 2nd half of the class is about "play" - very important since all work and no play makes jack a dull boy. We play Crossword games, Scrabble, various oral word games like "Atlas", "Name, Place, Animal, Things", "Spin a Yarn" and many more. The final aim of the 3-month Grammar workshop is to make the young students more confident with a balanced and well-developed personality.